I'm starting/started a 2D tilemap RPG game in Java and I want to implement random map generation. I have a list of different tiles, (dirt/sand/stone/grass/gravel etc) along with water tiles and path tiles, the problem I have is that I have no idea where to start on generating a map randomly. It would need to have terrain sections (Like a part of it will be sand, part dirt, etc.) Similar to how Minecraft is where you have different biomes and they seamlessly transform into each other. Lastly I would also need to add random paths into this as well going in different directions all over the map. I'm not asking anyone to write me all the code or anything, just piont me into the right direction please. tl;dr - Generate a tile map with biomes, paths and make sure the biomes seamlessly go into each other. Among the many other related questions on the site, there's an often linked article for map generation: Polygonal Map Generation for Games you can glean some good strategies from that article, but it can't really be used as is. to generate biomes based on the layers of noise you produced before. Typically this gives a fairly smooth transition between biomes and the transitions are logical. I also modify the moisture and temperature maps based on elevation. This naturally generates a "timber line" and produces rocky mountains with snowy caps. Additionally, you can see me scroll through a few more maps at the beginning of this video. How do I create tileable solid noise for map generation? While the other answers here are really good for generating the kinds of static landscapes that would work for this specific need. There are other methods that people coming across this question might be looking for if they want to create landscapes that change over time or appear much more realistic you can follow this technique. Unlike the other answers you begin this with an entirely empty map. Start with what you would consider to be sea level. Use Perlin Noise to add very slight variation, if you have 256 possible elevations, don't vary more than 3-5 in either direction. This builds the first few billion years of your landscape without having to actually run a simulation for that long. Split the map along straight or curved lines to create plates, the more detailed the shapes of the plates the more interesting your landscape with be. Keep them large. Give each plate a direction, speed. Over a given timeframe move the plates in step-wise fashion around the map, dragging all tiles above them with them. Where an over plate sits over an under plate, all those tiles move up 0-1 elevation steps, and the tiles follow the path of the over plate. Where an over plate crosses an over plate, all those tiles move up 1-2 steps, and the tiles in the cross over region no-longer drift. Where an under plate crosses an under plate, any tiles in the area with elevation greater than the 66% mark for both plates in the cross over region move up 1-3 steps (as if by volcanic activity, this will produce islands over enough time) and tiles in this area stop drifting. All plates that cross slow by 20% of their current speed each step. For added realism, add a random -10% to 10% change in direction of movement each step. After performing the desired number of steps. Probably 5-10 are plenty. Any tiles where no plates are resident, should be dropped to the lowest existing level. This map can be used as is, or be expanded to create a much larger map by breaking it into 4X4 tile(cell) chunks and expanding those sections based on their individual elevations. Treat each cell's elevation as a point, and create a smooth gradation in the larger map between those points. So, if the larger map is 40X40 instead of 4X4, and point (0,0) was 10 and point (0,1) was 1, the tiles on the larger map between them would be 10,9,8,7,6,5,4,3,2,1 in height. Further Perlin Noise can be added to de-smooth the slopes. Over all this scaling technique is similar to the Diamond Square algorithm. To simulate rivers and lakes, oceans and water tables. I prefer to use cellular automata. If a neighbor cell is more saturated, increase saturation and gain height. If a neighbor cell is less saturated, decrease saturation and lose height. You can also simulate wind, and therefore temperature changes based on the elevations. You can step back and forth between running the temperature simulation and the water simulation if you want. However I haven't built anything using temperature changes so I won't comment on how to do that. 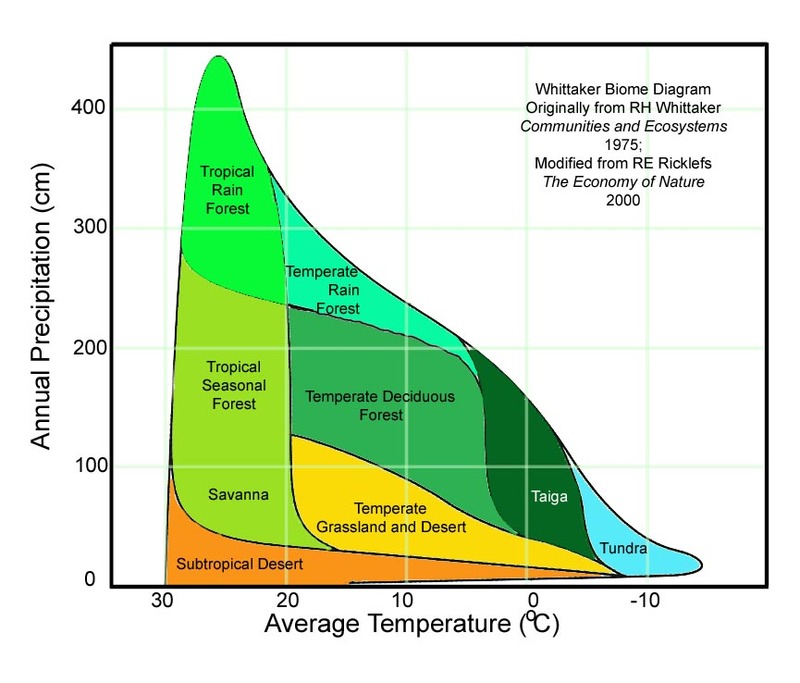 If you keep the simulations for land, water, and heat around and dramatically reduce their effects and also stop the plates from moving, you can continue to change all of these metrics over time. I wouldn't run the calculations very often, but you can get a world map that responds to changes this way. While these kinds of techniques are way more involved, they produce a lot more realistic and evolving effects. Take it for what it is worth? You can use Perlin Noise for the generation of the terrain, here is how the biomes in Minecraft work. 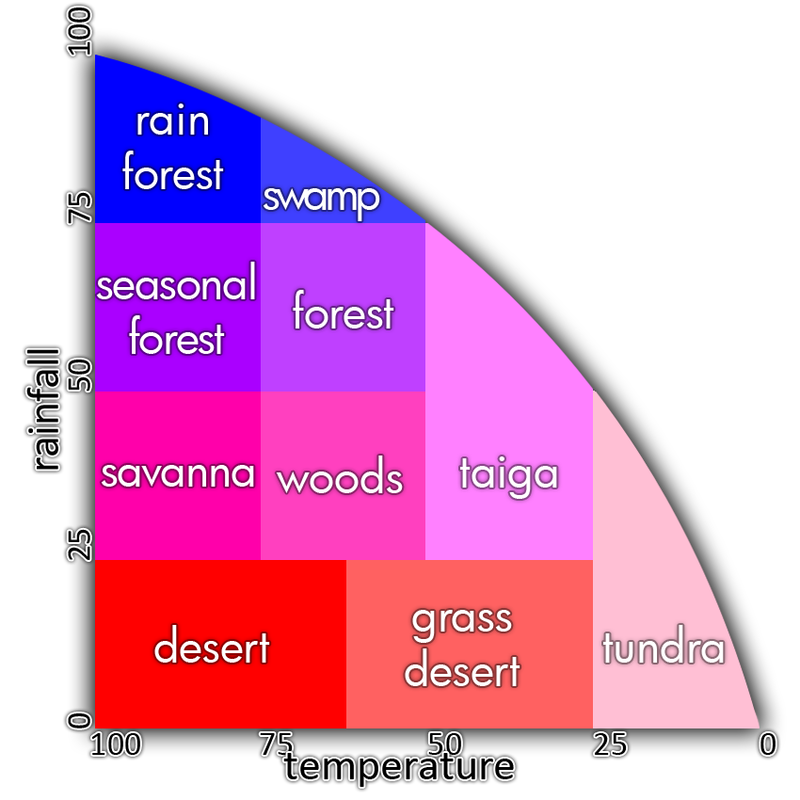 As you can see he uses a heatmap in combination with a rainmap to create the biomes. Not the answer you're looking for? Browse other questions tagged tiles maps tilemap or ask your own question. Algorithm for continuously generating a tile map for a topdown 2D game? How can I create a random “world” in a tile engine? How do I randomly generate a top-down 2D level with separate sections and is infinite? Smooth Biome transitions with tile map?